Mosaics are, in my view, one of the greatest arts of the ancient world. Whilst great sculptural reliefs, paintings and majestic architecture amaze me too there is just something memorizing about the art of the mosaic. Since they appear to be the staple of fine Roman archaeology in Britain I have been exposed to them a lot more than the other classical arts which seem to have survived in greater quantity around the Mediterranean, so perhaps this is the logical basis for my fascination, perhaps not. Either way they’ve fascinated me enough to start making my own. 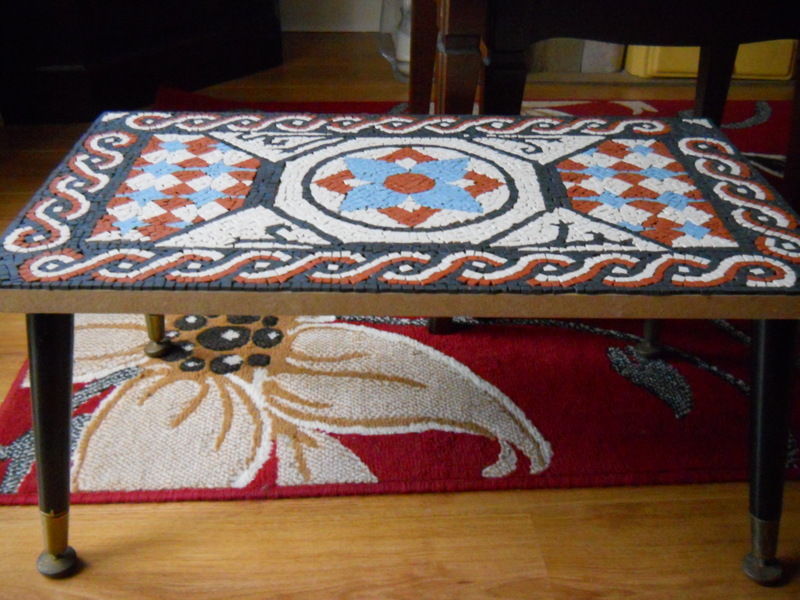 Tesserae tiles are fairly easy to come across over the internet, so are the glues and patterns but here I decided to make my own pattern using the many mosaics in Britain as an inspiration, but this creation of the design was the hardest part. 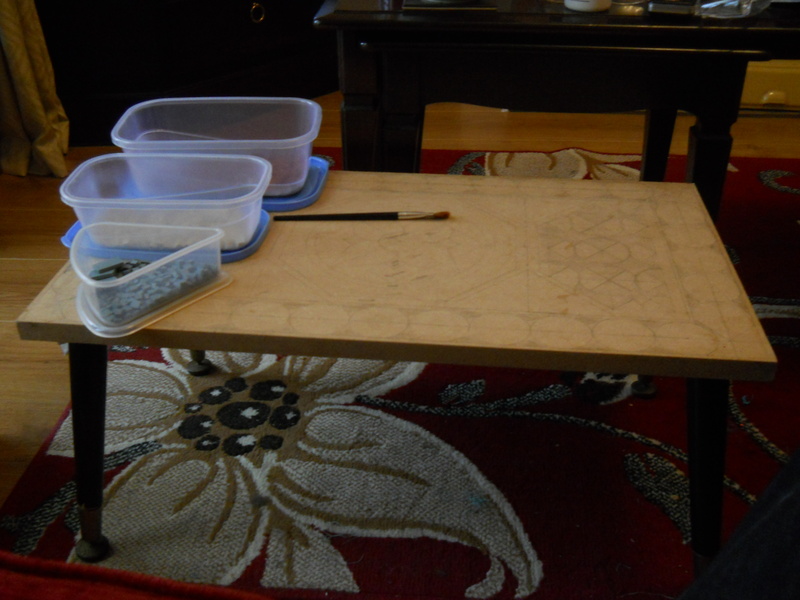 Archaeology has shown that one of the ways ancient mosaicists prepared theirs was by scoring the design into the foundations as a guide for when laying the tesserae and so I too adopted this method using pencil on wood as the way to create my pattern. My design was a geometric one so this involved a lot of time calculating angles, drawing lines & circles and bisecting them all in order to make it as symmetrical as I could. I must admit this took longer than I would have thought. With the design made it was time to cut the tesserae, these days we can buy them in sheets and cut them with hand wire cutters, so it is not nearly as intensive as it would have been 2000 years ago, nevertheless even sitting down doing it in front of the tv can make your back ache a bit after extended periods so I sympathies go out to ancient workshops mass producing tiles all day as I can imagine that they would have experienced some suffering for their art. After the tiles are ready and you start sticking them down it comes together surprisingly quickly, each of the photographs are taken after a session of making and it really shows how the design rapidly fills out. 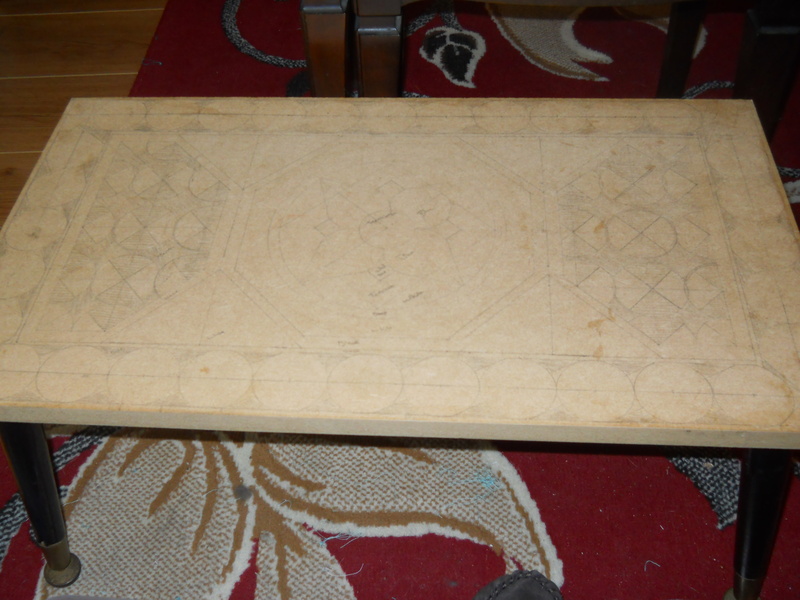 Obviously the larger the design the longer it takes, this is just a simple rectangular coffee table I imagine making a floor is a whole different story. 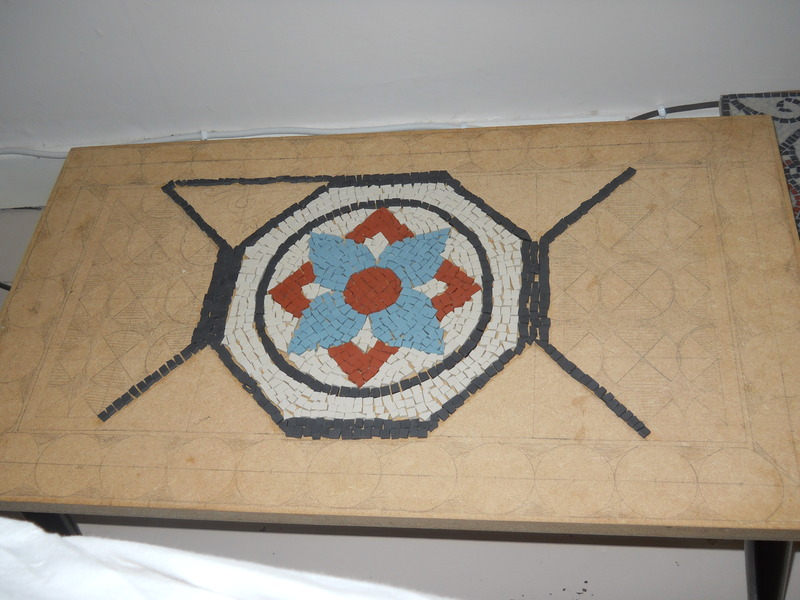 A much messier story too, my mosaic used simple PVA glue stored in a plastic bottle which was administered by a brush, ancient mosaics would have been on their hands and knees dealing with mortars and cement. 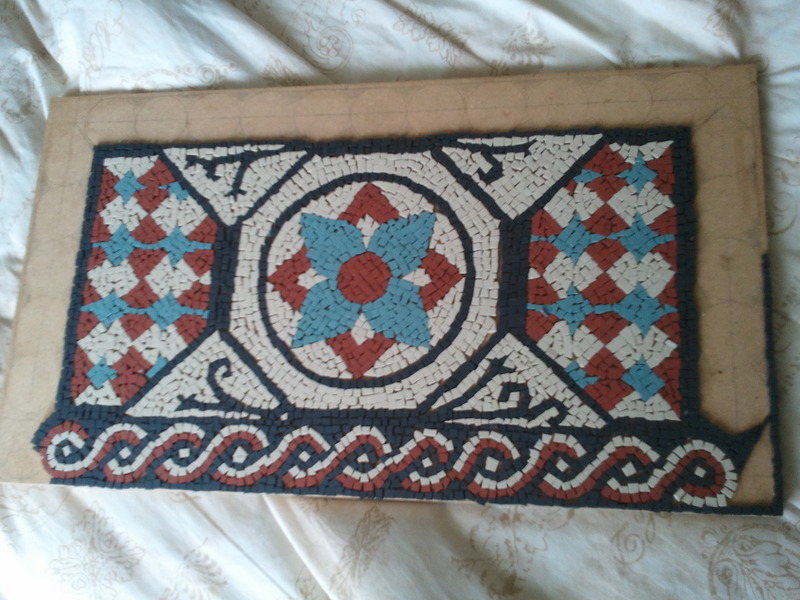 Nevertheless the whole process of making the mosaic is actually quite therapeutic as it doesn’t require a huge amount of concentration, furthermore physically using ones hands to make something is rewarding and the activity is good, we did not evolve to sit around doing nothing. But psychological affects aside, at the end of it you have your very own mosaic and what could be better than that. The finished product, just pending grouting. Thank you, Benedict, for liking my Equus-shield – also the fruit of painstaking work making dots! Thanks, I’m glad to hear that you like it! 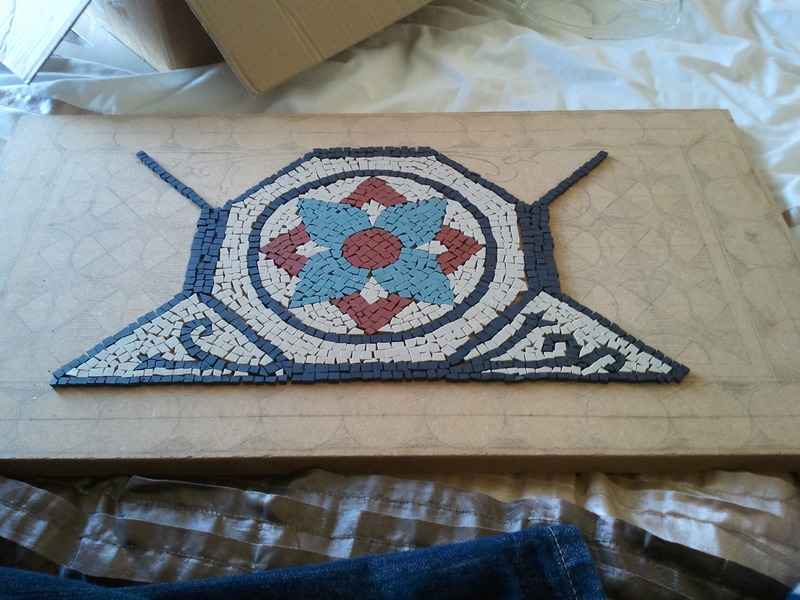 I’ve thought about making a mosaic floor before but I think I need to buy my own place before I make changes like that. 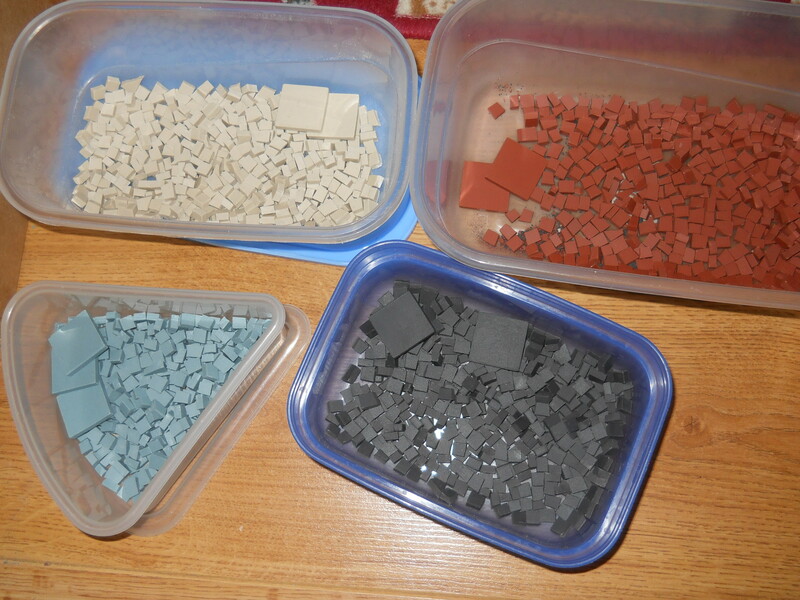 But I’m still making more, in fact I’ve been too busy with mosaics to blog!